With the pristine beauty and tranquility, Tam Giang lagoon makes anyone coming here have to admire and burst into joy. 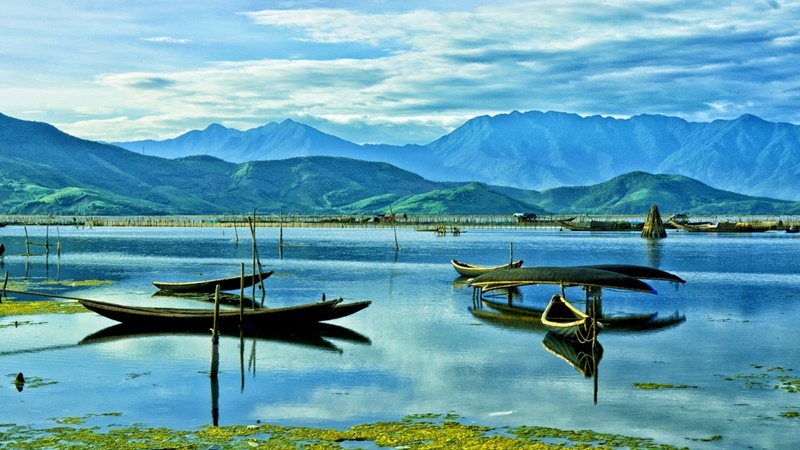 Tam Giang Lagoon is where the Perfume River, Bo and O Lau Rivers meet before they flow into the sea through Thuan An estuary in the central province of Thua Thien-Hue. The description with 4 ‘no’, “No road, no electricity, no school, no health center” is what everyone used to describe the communes along the lagoon in the past. They are really like the oases separated from the outside world. Why Tam Giang Lagoon is special? Stemming from Thuan An harbor, small boat sweeps on O Lau river along the length of the lagoon. More than 15 kilometers, fields and bridges along lagoon, we come to Thai Duong Ha village. After 30 minutes, the boat comes to iTam Giang lagoon has 24 kilometers length with an area of 52 square kilometers, Phong Dien, Quang Dien, Huong Tra, Thua Thien Hue. Stemming from Thuan An harbor, small boat sweeps on O Lau river along the length of the lagoon. More than 15 kilometers, fields and bridges along lagoon, we come to Thai Duong Ha village. After 30 minutes, the boat comes to island on the lagoon; there has Thai Duong ancient village.sland on the lagoon; there has Thai Duong ancient village. What to explore at Tam Giang Lagoon? At the wharf, there is the animated market with a plenty of market area in city, especially in the afternoon, junks and boats comeback along with shrimp, fish, cuttle-fish. Thai Duong Ha communal house village is complex with traditional Vietnamese village and just has specific culture in decorated temple of Thua Thien Hue, they are solemn and sparkle. Each three years, Thai Duong Ha communal house village holds "Cau ngu" festival on January 12th lunar. Thai Quoc pagoda has a combination between modern and traditional architecture but solemn, quiet in the space with many trees. Village road is very clean which is paved with concrete, both sides have many small villa, in front of the house, they worship ancient people. In the village, there have many big churches, unique architecture as sparkling temple. Thai Duong Ha village often brings surprises for tourists when standing “tombs city” which was built as small villa with beautiful patterns. Some “house” is lit up throughout the day. After go along lagoon, tourists can enjoy specialties in this place. Fish, cuttle-fish, shrimp are displayed. Scenery of sunset is the most spectacular beauty in Tam Giang lagoon. The violet of heaven covers the lagoon which creates the beautiful pictures “Tam Giang lagoon”. A number of visitors stop in this place to take some photos; they want to have some pictures about sunset with sparkling view here.